Hiroko Fukui - Time of the Year! Still am incredibly impressed by this. Big Ben and the double decker bus are iconic and immediately recognizable! Brilliant! Oh and to add you get five crowns AND either three more crowns added onto the five, or a request! Congratulations, you won the EXTRA prize in my Around the World contest, chosen by my brother! He says he loves the top and the umbrella and that the background is amazing! 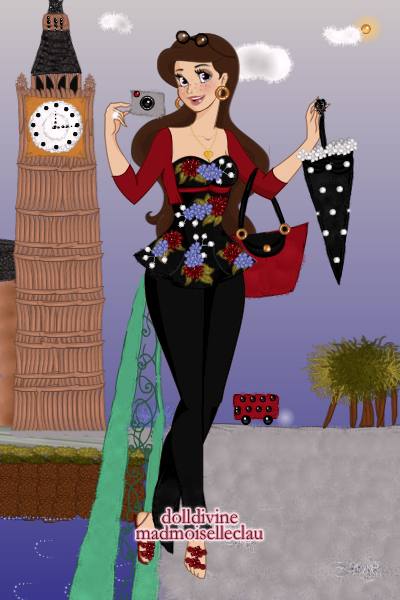 this is amazing!so beautiful,love those details like the purse and umbrella!the bg is also stunning! This is just amazing, I love her top, I need to know where to buy it! :D And of course, that background is stunning! Big Ben and the bridge's railing look perfect! I really like the double decker bus too, so cute! Great camera and umbrella too, brilliant! The time devoted to this doll is incredible. Your attention to detail is beyond reproach!